Manitex International, Bridgeview, Ill., has announced that it is launching a new 50-ton capacity, rubber-track-mounted, telescopic-boom crane named the Manitex 50155GT. Manitex believes the 50155GT is the highest-capacity crane ever mounted on a rubber-tracked carrier. The first unit is now in production and will be delivered in September to a customer in the mining industry. Manitex expects that the 50155GT’s high capacity, ability to lift a two-person work platform to a height of 200 feet, and rubber-tracked maneuverability will also prove ideal for constructing and maintaining electrical transmission lines. The 50155GT travels on tracks, but uses outrigger support for lifting. With its outriggers fully extended to 23’3”, it lifts 50 tons at a 6-foot radius on its 38.5-foot minimum boom length. With the five-section boom extended to the 155-foot maximum length, the 50155GT’s capacities range from 9,000 pounds at a 35-foot radius to 840 pounds at a 115-foot radius. A 39-foot single-piece swing-around jib pin-connects to the boom point for extra lifting height or to raise an aerial work platform to the 200-foot maximum height for high-reach work. The upperworks can swing 360° with any rated load. When traveling on site, the 50155GT has the power to travel over rough terrain and the low ground-bearing pressure to traverse soft or marshy ground. Its Tier 3 Caterpillar C-9 diesel engine delivers 375 hp, enabling the rig to climb a 60-percent grade, and the carrier’s twin 43-inch wide tracks keep ground-bearing pressure to about 4.5 psi during travel. For road transport, the complete 50155GT measures 11’4” wide, 11’1” high, and 44’8” long from the tip of the retracted boom to the rear of the upperworks pedestal. The carrier measures 24’8” long, and the entire unit, including upperworks counterweight, weighs in at 78,000 pounds. It can generally be transported on a three-axle, double-drop gooseneck trailer without an overweight permit. Composed of proven components, the 50155GT was developed and sold by Badger Equipment Co., Winona, Minn., part of the Manitex International family of companies. The new rubber-tracked crane combines major components from the upperworks of a Manitex 50155 boom truck with a low-profile pedestal developed from the Badger CD4430 rough-terrain crane and Prinoth’s Go-Tract 4500 tracked carrier. Although Badger sold the first machine and is engineering the mating of the crane components, pedestal, and carrier, the 50155GT rubber-tracked crane is being marketed under the Manitex name. The 50155GT’s five-section telescoping boom, fully enclosed crane operator’s cab, boom cylinder, jib, winch, swing drive, swing bearing, and jib are identical to those on the truck-mounted version of the Manitex 50155, produced by Manitex, Georgetown, Texas, another member of the Manitex International family of companies. The hydraulically operated out-and-down outriggers are similar, too, except that their hydraulic jacks offer about six more inches of vertical travel. To keep the machine’s overall travel height under 11’1”, Badger replaced the Manitex upperworks pedestal with a low-profile version of the pedestal used on Badger’s CD4430 rough-terrain crane. The pedestal mounts atop the swing bearing and supports all of the other upperworks components. In addition, Badger reinforced the area of the Prinoth carrier that supports the crane in order to distribute the loadings generated by crane operation. 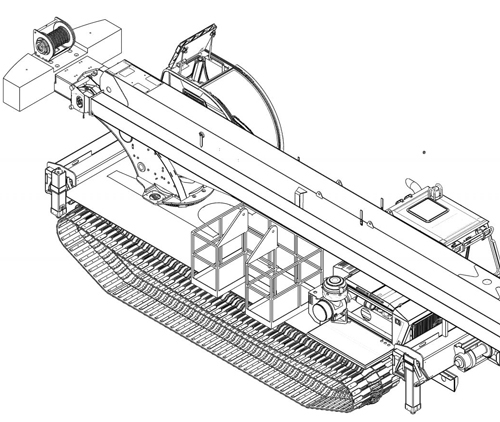 Other than the structural reinforcing and outriggers, the rubber-tracked carrier is a standard Go-Tract 4500 from well-known carrier manufacturer Prinoth LTEE, Granby, Quebec. The Go-Tract 4500 is field proven to deliver superior performance on soft or marshy ground and hilly terrain. It stands 11’4” wide to the outsides of the tracks. Each track measures 43 inches wide, is controlled independently, and can be counter rotated for pivot turns. Maximum travel speed is about 6.0 mph.